Restless legs syndrome (RLS) doesn't only affect adults. RLS is a neurological condition with a genetic component, and often times runs in families. 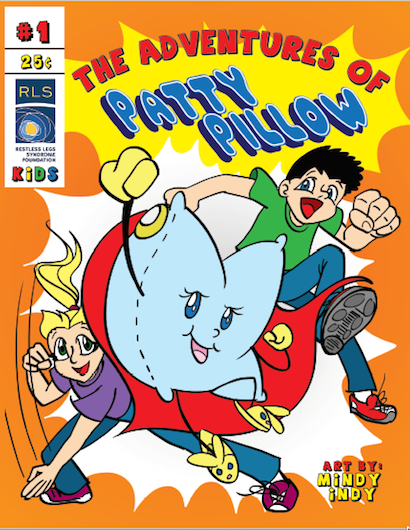 In the United States alone, RLS is believed to afflict an estimated 1.5 million children and adolescents. Although most research has focused on adults, RLS symptoms often begin during childhood or adolescence. About 35% of patients report RLS onset prior to age 20, and one in ten report that the syndrome appeared during the first decade of life. 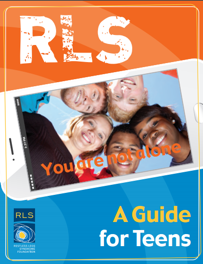 Inside: This guide offers an overview of RLS symptoms, treatment, coping methods and more. Inside: A guide to help teens with RLS take control of their lives as they transition into adulthood. Inside: A guide for parents and their young children diagnosed with RLS. 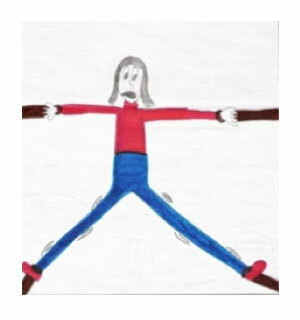 Inside: Experts weigh in on RLS and Periodic Limb Movement Disorder in children and adolescents. Like adults, children with RLS tend to seek relief from their discomfort by moving their legs—often by fidgeting, stretching, walking, running, rocking or changing position in bed. Parents or healthcare providers often mistakenly label the child’s discomfort as "growing pains." In the classroom setting, attempts to relieve the uncomfortable feelings of RLS may be interpreted as inattentiveness, hyperactivity or disruptive behavior. RLS, however, is a real medical condition that calls for proper evaluation, diagnosis and treatment. Sleep disturbance is a common problem with RLS. 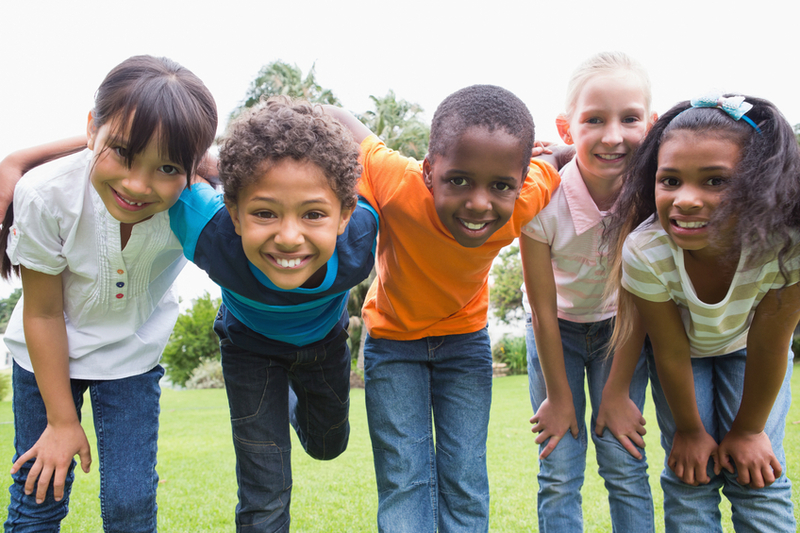 In children, the sleep disturbance may precede or overshadow the complaint of leg discomfort. The quality and quantity of a child’s sleep are often diminished, and this sleep deprivation can result in moodiness, irritability, inattentiveness, fatigue or hyperactivity. Unlike most adults with RLS, children with RLS often complain of sensations more during the day than at night. For more information on how you and your child can cope with RLS, become a Foundation Member to download our publications that focus on RLS in teens and children. As a member, you will receive the latest news on advances and treatments, all while supporting research toward a cure. 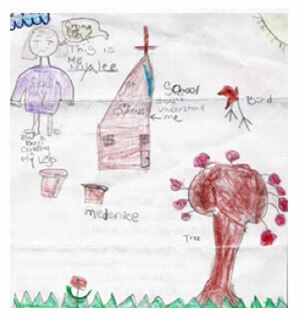 How do children describe their RLS symptoms? 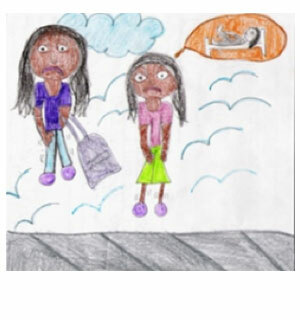 The images below from a Foundation sponsored drawing contest are powerful illustrations that demonstrate the difficulties and often desperate feelings that RLS symptoms present in childhood. Please note: all pictures are copyrighted by the RLS Foundation. Please contact us for potential use of these photos. 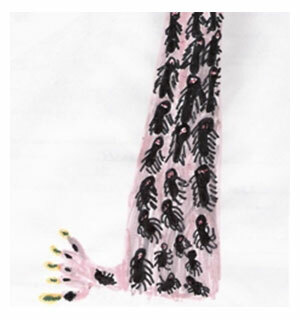 Description of drawing: I have bees crawling on my feet and legs and it itches so much. And in school I can't stay still. And I am always tired and sleepy, daydreaming. And I cry because teacher and kids are mean to me and laugh about me. 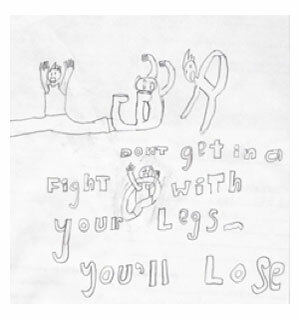 Description of drawing: My drawing shows me fighting with my squirmy legs. And I know I can never win! Description of drawing: Walking home from school, legs hurting and tingling. Thinking about legs bothering me all night. Description of drawing: It feels like I need to stretch my legs. My drawing is showing me being stretched out by ropes because I feel like I need to stretch my legs whenever I go to bed or if it's late. Description of drawing: When I get RLS pain it is deep to the bone. It feels to me like my bones are being twisted around and I can't move my legs. My picture shows me behind an X-ray to see my bones. Description of drawing: Bugs crawling in my legs. 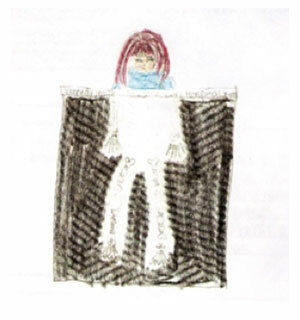 Sarah – 10 Honorable Mention Description of drawing: What I drew was saying that my top part of my body is relaxed and calm, but the bottom wants to run really bad. 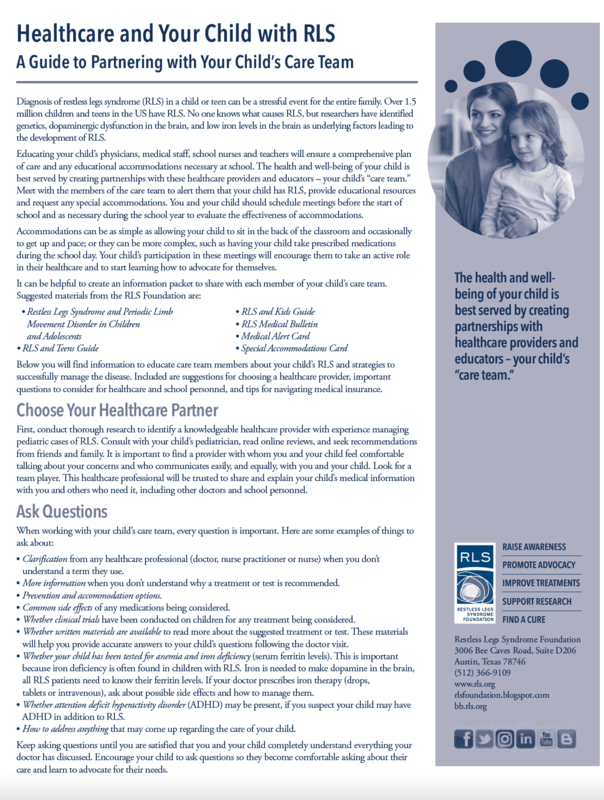 If you or a your child have RLS, you are not alone. Questions?